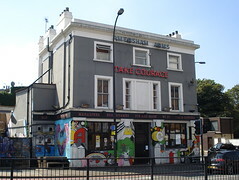 This pub in New Cross, opposite New Cross Station, has gone through many changes. When Bec first lived in New Cross it was a proper old man pub, complete with cranky Irish dudes watching the racing and scowling at ladies who dared to order pints. Then it went a bit student-y, benefitting from nearby Goldsmiths College, but fairly standard, and now it's been taken over by the [Lock Tavern]? people and has been reinvented once again. They've gutted the insides and there are comfy sofas everywhere. The bar is in the centre, straddling two rooms. The front room always functions as a pub, bright and laid out with tables and some banquette seating around the walls. The other room is adaptable to whatever event may be happening, and may feature tables, or deep and comfy sofas in an even darker rear area photo from back room, though this latter also functions as a stage when live music is playing. Food looks interesting photo of the menu as of March 2011. On a visit in March 2008, Bec had the mug of soup with unlimited bread and duly ordered further bread, which came soon enough (though we had a fair wait for our food to come initially). The hummous and pitta bread had tasty fresh hummous and warmed slightly crispy bread, while the vegetarian burger was a little dry, but the chips were thinly-cut and well-cooked, very nice and came with a chunky tomato salsa as well as salad. Ewan's vegetarian burger in June 2009 was still a little dry, but served with some tasty chips. They make a careful note on the menu of the provenance of ingredients, as well as the pies (which are Goddard's, and include a soy mince option). Other fun stuff: a bar billiards table (covered up on a June 2009 visit), up and coming bands (as well as the occasional gig by established acts once in a while, though these sell out very quickly) and DJs in the Catapult behind the pub, and events like Bingo Bring & Share. There's a jumble sale which takes place once a month on a Sunday (they use an upstairs room for this as well, though the room is not normally open to the public at other times). According to Brockley Central, as of September 2012 there's a quiz every Sunday at 9pm. Bec's verdict: The pub is still student-y, but mostly relaxed, friendly and an awesome local. The only thing I can complain about (because I can always complain about something) is that the bar staff are far too young. Seriously, they look about twelve. Disturbing. Accessibility: A step up to get in. Last visited by Kake, March 2011. Opening hours taken from the Amersham Arms website, April 2011. Last edited 2014-08-03 23:13:08 (version 26; diff). List all versions. Page last edited 2014-08-03 23:13:08 (version 26).